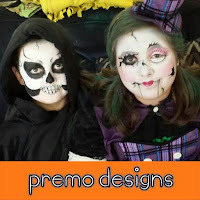 Premo Designs Blog - Face Painting: Halloween is right around the corner..... PAINT YOUR FACE! Halloween is right around the corner..... PAINT YOUR FACE! If you are anything like my family your kids are picking out their costume ideas for the next year shortly after Halloween is over; sometimes before. Halloween is almost here... oh the excitement! Costumes and Accessories are what it's all about! Whether you're putting together your own costume or standing at party city calling out for a number off their giant wall of photos; you want to like what you are going to wear, or what your kids put on; and if there is a costume contest.... win it! Masks are no fun!! Even with as far as they have come (I remember when they had the little stretchy band stapled in the side and it always snapped or ripped the side of the mask) - they are still uncomfortable most of the time, they usually look cheap, you sweat like crazy, you can't eat or drink, and hardly anyone ever keeps them on for longer than a few minutes. Now my solution is... PAINT YOUR FACE! Besides having unlimited options to what you can do it eliminates a lot of issues and many times you can turn regular clothes into "costumes". This past year my daughter didn't want her face painted like she had previous years; she wanted to buy a costume. As much as I LOVE PAINTING MY KIDS, I agreed to let her buy one last minute. She is big for her age and all the store costumes in her size were, nicely put - too risky! So after searching online she finds "the one" - a $60 Broken Doll costume! I will admit, it looked cute in the package. I told her we could get a plaid outfit and paint her face, but nooooooo she had to have "a real costume this time". So I bite the bullet and order the non-refundable costume... Can you guess how it was? I should have known better but I thought for the price the quality would be better. The costume itself was thin and had tiny pieces of velcro that wouldn't stay. The mask was cheap, odd shaped, and didn't fit her face correctly. We literally got the costume in the mail the day before Halloween. Too much money spent and no time left to buy a new one. We were both quite upset but had to make the best of it. October is a super busy month for a face painter. If you plan on booking, hurry up... you may already be too late. There are birthdays, festivals, company parties and of course costume parties, and private makeup sessions for Halloween. People book a year ahead of time for months like this. Below is a quick face I did on my daughter and and more detailed face for a client - both with regular clothes as part of their costumes. 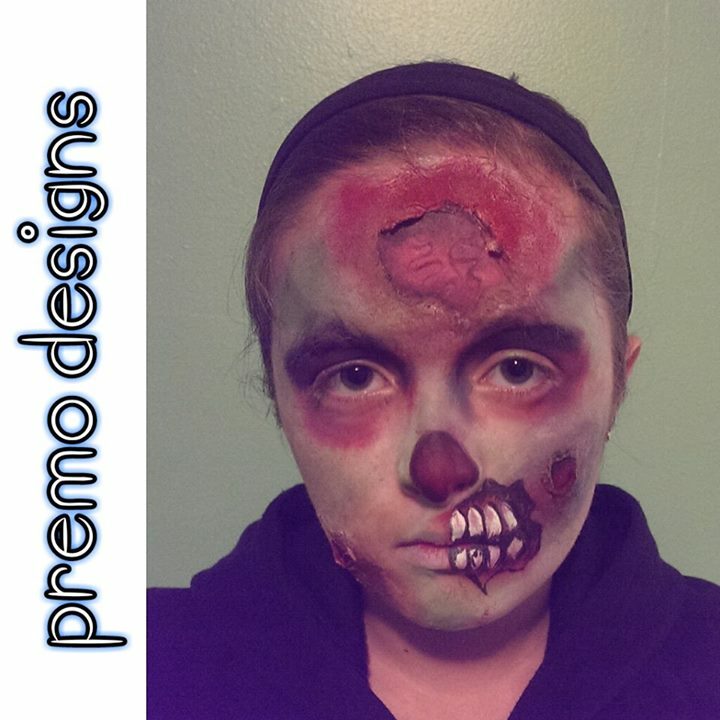 Who doesn't love Zombies?? They have taken over the world! This was a quick 15 minute face paint, she threw on a hooded sweatshirt and some jeans with tears and had everyone freaking out. She also has a killer "zombie walk". We went to the mall like this and even some adults were a little scared. This was a private session that took about 45 minutes to complete. I did this with an airbrush and waterproof makeup so it would stay on all night at a costume party. As I was painting him he told me how his sister in law is terrified of clowns and he thought it was going to be so funny to scare her - and not be able to remove a mask. 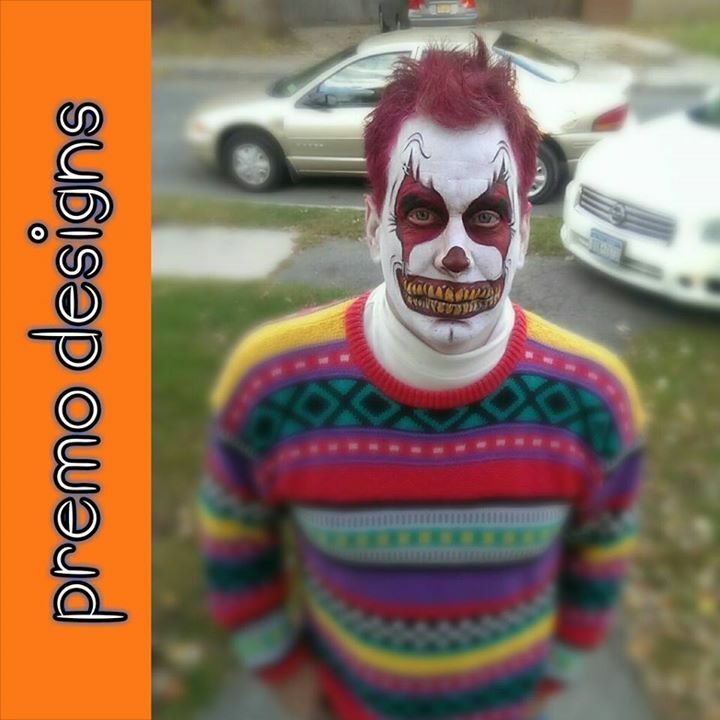 Not sure if he owned that sweater or if he bought it for Halloween but it definitely went well with his face. 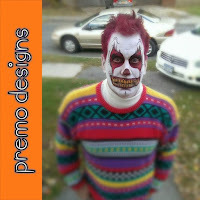 Done professionally a painted face and/or body transforms a person into something else. I realize that not everyone has the supplies or skills to paint a face. Consider hiring a professional! Check out Premo Designs and Contact Us to discuss your ideas and reserve your spot! 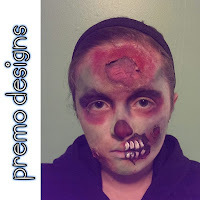 Make sure you check out my blog post What to Look for When Hiring a Professional Face Painter. I'm sure like me you have seen or experienced DIY face paint - not always the best. Before I decided to invest in this career I used to paint my kids faces for fun. When looking back at pictures of what I did before having the proper tools and knowledge... it's laughable. You can save yourself a lot of frustration, time, and money if you hire a professional to do what they do best! If you are looking to avoid makeup or can't get a spot with someone in your area, check out pinterest for tons of ideas on turning regular clothes into costumes!